Woman to Woman: Behold, the Lamb of God! Jesus Christ's own cousin, John the Baptist, prophesied with these words, "Behold, the Lamb of God, that takes away the sin of the world! ", the reason for Christ's first advent into our world. 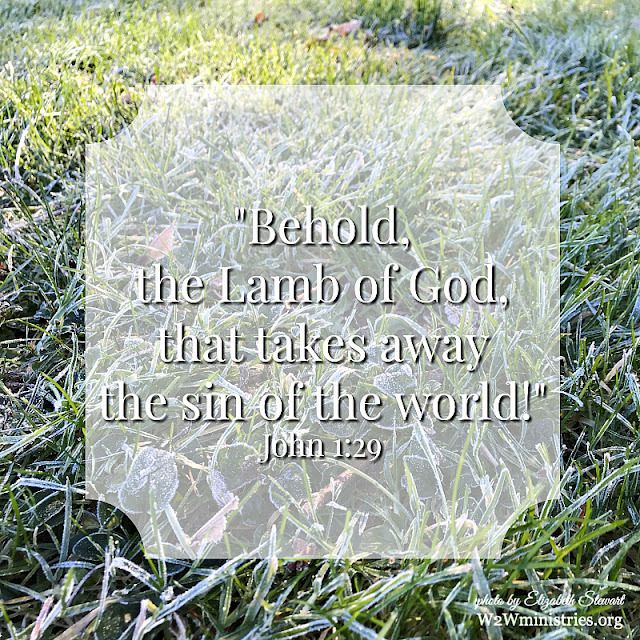 He came to be the long foretold sacrificial lamb for our sin, the once and for all sacrifice we would ever need, putting an end to ritual sacrifice for atonement of sin. His disciples, His family members, His own people, were focused on the Old Testament prophesies of the Messiah as King. Surely, if Jesus Christ really was the prophesied Messiah, He would put an end to Roman rule and reestablish the kingdom of Israel. Jesus told them with His own mouth about His coming death, but they couldn't quite wrap their mind around it-couldn't make sense of it in the light of the Messianic prophesies about His rule and reign. The Jews had been following the Levitical sacrificial system for atonement for sin for centuries upon centuries. Yet, they were blind to the fact that it was a foreshadowing of a perfect, sinless, spotless Lamb Who was to come. They could not comprehend that He came to do what no animal sacrifice was able to do. He came to satisfy once and for all the holy justice of God on our behalf. He was the scapegoat for our sins provided by our Father, the atonement that didn't just cover our sins for a short period of time, but removed our sins forever, abolishing the debt of sin we could never pay on our own. And now, we must realize, as we await the advent of His second coming, that Jesus Christ will not be returning as a Lamb. When our eyes behold Him, it will be as King of Kings and Lord of Lords-the fulfillment of the prophesies and promises to His people that there would be One from the lineage of David Who will reign forever and ever. There are many who willingly accept that God sent His Son to be born of a virgin, live a sinless life, die a substitutionary death, and rise from the dead victorious-yet, don't think about, or perhaps don't believe that He will likewise fulfill every prophesy and promise about His return to rule and reign. He was a man with a mission on His first advent-to be our sacrificial lamb. Likewise, He will return with a mission-the final consummation of the full and total redemption of His creation. He will make all things new and He will reign forever and ever as has been prophesied and promised. And so, as His people, we wait expectantly and hopefully for His second advent. O Come, O Come Emmanuel! The Advent Season is such a beautiful and profound time in which we remember the past so that we can anticipate the future. Thank you for reminding me this morning ... He was, He is and is to come! Blessings! Amen! I'm longing to see Him!